Matplotlib is a popular Python module that is used to create charts. 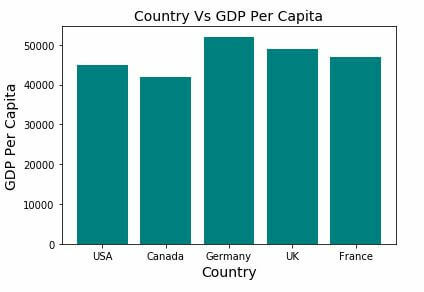 In this tutorial, I’ll use simple examples to show you how to create Scatter, Line and Bar charts using matplotlib. Let’s start by reviewing the steps to create a Scatter plot. Scatter plots are used to depict a relationship between two variables. 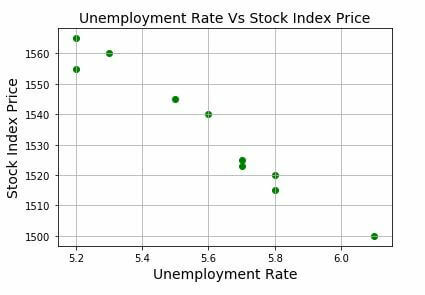 As indicated earlier, this plot depicts the relationship between the Unemployment Rate and the Stock Index Price. You may notice that a negative relationship exists between those two variables, meaning that when the Unemployment Rate increases, the Stock Index Price falls. Scatter diagrams are especially useful when applying linear regression. Those types of diagrams can help you determine if there is a linear relationship between the variables – a necessary condition to fulfill before applying linear regression models. Let’s now see how to create the exact same scatter plot, but only this time, we will use pandas DataFrame. Another way in which you can capture the data in Python is by using pandas DataFrame. You’ll need to install and then import the pandas module, in addition to the matplotlib module. Next, we’ll see how to create Line charts. Line charts are often used to display trends overtime. As before, we’ll see how to create the Line chart using a List, and then via the DataFrame. 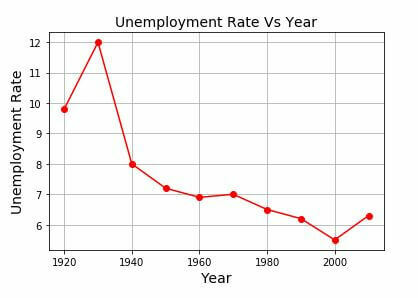 You’ll notice that based on the data captured, the unemployment rate generally falls over time. In the final section, we’ll review how to create a Bar chart. Bar charts are used to display categorical data. Unlike the previous examples, which included only numerical data, the data-set that will be used contains both text and numerical data. Notice that the Country column contains text/strings (wrapped around quotations for each value), while the GDP_Per_Capita column contains numerical values without the quotations. You may want to check the following tutorial that explains how to place your matplotlib charts on a tkinter GUI. Finally, you can find additional information about the matplotlib module by reviewing the matplotlib documentation.